Wikipedia says that pasta alla carbonara (usually spaghetti, youth health but occasionally linguine or bucatini) is a family of Italian pasta dishes based on eggs, what is ed cheese, tuberculosis cured pork, and other ingredients. I was very much craving the original carbonara, but it’s a bit of a heart attack on a plate. The original requires too much butter and bacon and too little vegetables. For this dish, I omitted the meat completely and added a healthy dose of leeks and mushrooms. I also swapped the standard white spaghetti for some whole wheat fettuccine. I kept the eggs for protein and the cheese for tang. It was a simple recipe that made for a delicious weeknight dinner. Set a pot of water to boil. In the meantime, melt the butter in a medium-high skillet and then add the leeks, mushrooms and garlic. Toss for about 1 minute, then add the white wine. Continue to sautee the ingredients until the mushrooms have released their liquid and the leeks have wilted and begun to brown a bit — about 5 – 6 minutes. Once the pot of water comes to a boil, salt it and add the fettuccine. When the pasta is amost al dente, reserve 3/4 cup of the starchy pasta water and drain the remaining liquid. Reduce the heat to lo, dump the pasta back into its cooking pot (on the heat source) and cover with the leek/mushroom mixture. Quickly pour the beaten eggs over everything and then the pasta water. Toss quickly so that everything is evenly coated with the egg and cook for 1 more minute. 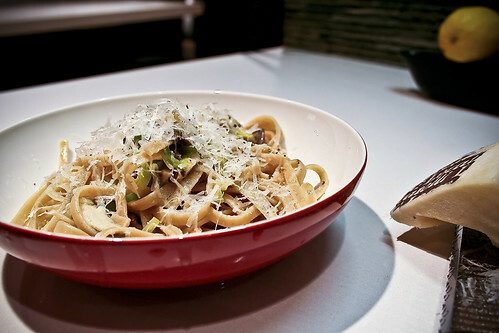 Serve the pasta in a bowl and top with a generous portion of Pecorino cheese and fresh black pepper. I really like mushrooms but 3 lbs of mushrooms to 1 of pasta seems out of line. Is the measurement correct? The measurement is correct – they cook down to less than 1/4 of the original volume. Same with the leeks. I also prefer my vegetable to pasta ratio to be 1:1. Feel free to half or third the amount of mushrooms if you prefer more pasta. The rest of the recipe should still hold up. i have made vegetarian pasta carbonara like this before but often missed the pancetta quite a bit…you didnt find that you missed the flavor? TaraTakesCake – Well, it’s definitely better with pancetta, but sometimes you just want something lighter. This pasta is for those times.